This was hands down one of those spur of the moment, I cannot leave Sephora without this purchases. I had looked at the Stila Nouveau Natural Eye Shadow Palette online a few times and told myself I didn't need it. That was until I saw it sitting front and center at the Stila stand. Years ago when I first started falling in love with makeup I stumbled upon a Stila palette at Nordstrom and begged my mom to buy it for me for Christmas. They don't even make it anymore - it was slim with six shades (that were all totally wrong for my complexion) but I thought it was beautiful. By the time Christmas rolled around the palette was sold out, but somehow it ended up under my tree. It was my very first "high end palette". I felt incredibly grown up. Almost ten years later, here I am lusting over more Stila palettes. 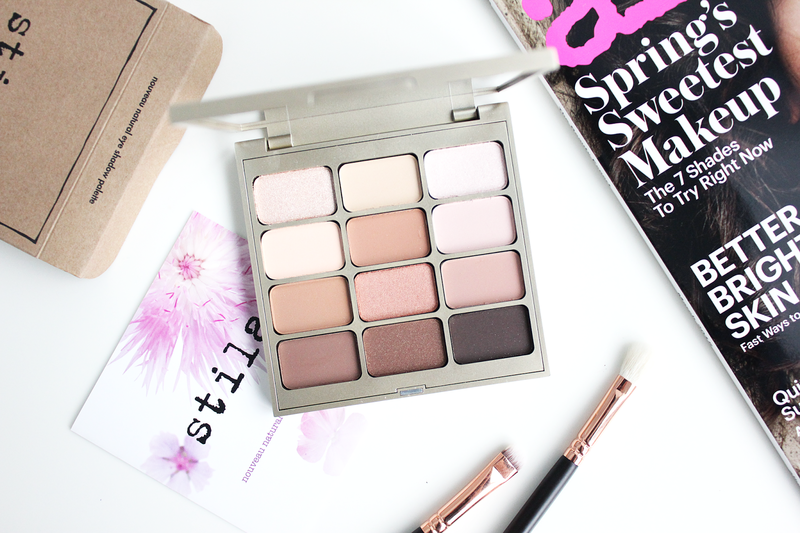 This palette contains four shimmery shades and eight matte shades - all with warm undertones. In terms of pigmentation pretty much the entire palette has amazing color payoff. The shimmery shades 'Kitten' (the top left) and 'Gilded Gold' (bottom middle) have amazing pigmentation and can be built up beautifully. The only shade I had trouble with was 'Understanding' (second from the bottom right) which was less buildable than the rest. The texture of these shadows is extremely creamy and glides onto the eye so well. They are finely milled, super blendable, and have just a small amount of fall out that can be easily brushed away. There is minimal creasing and the colors are super long lasting. Lastly...packaging. I'm a sucker for good packaging and that was half of what drew me to this palette. The casing is lightweight, but sturdy and inside is a massive mirror which is such a plus. I almost never have a mirror on the go and the mirror inside my other products can't even compare to the size of this one. Not only is it perfect for applying products on the go, the hinge allows you to position the mirror any way you'd like. Also, can we talk about the matte gold exterior with glossy gold 'Stila' embossed across the front? Gorgeous. Let me know, what palettes are on your radar this Spring. Will you be scooping up this one? Wow, this palette is stunning! It's a shame that I'm on a palette buying ban because this one is right up my street. I need to be on a palette buying ban myself! I can't figure out where to put them all!! This is a beautiful palette! Stila always do some lovely ones. I'm trying to hold off buying any more at the moment until i've used up some i've got, but i'm always tempted by Stila. Everything at the counter was so pretty! They way they've branded these new products is spot on! Stila isn't so common in the UK, but everything I have used by then before I have loved! This looks particularly fantastic as I love neutrals! I really love this palette!!!!! Isn't it just the prettiest?! Love Stila palettes! My In The Light palette is well loved and I bought it cause of Kitten but ended up loving the other shades too. They did a great job with the new palettes the packaging is so nice and luxe compared to their old palettes. Kitten was one of the main reasons I got this one! I swatched it first and knew the rest of the palette would be perfect. I don't usually gravitate towards Stila products, but I don't think I've ever really given them a chance. I like how the colors in this palette are a nice combination of matte and shimmer shades, which are very easy to work with! I'll have to keep my eye out for this one! I haven't purchased much Stila lately but their new stuff is so on point! The palette/colors are so easy to work with! You definitely should :) It's well worth the buy! This palette is so so stunning, I really want to try it out! The colors all blend so well together and can go from day to night - definitely grab it if you get the chance to! I'm a sucker for pretty palettes..This is gorgeous! the colors look lovely and so does the packaging! This palate is what dreams are made of! I love a lot of the higher shades, because I feel like i play out my Naked Basics palate sometimes, so the possibilities with this one are endless! 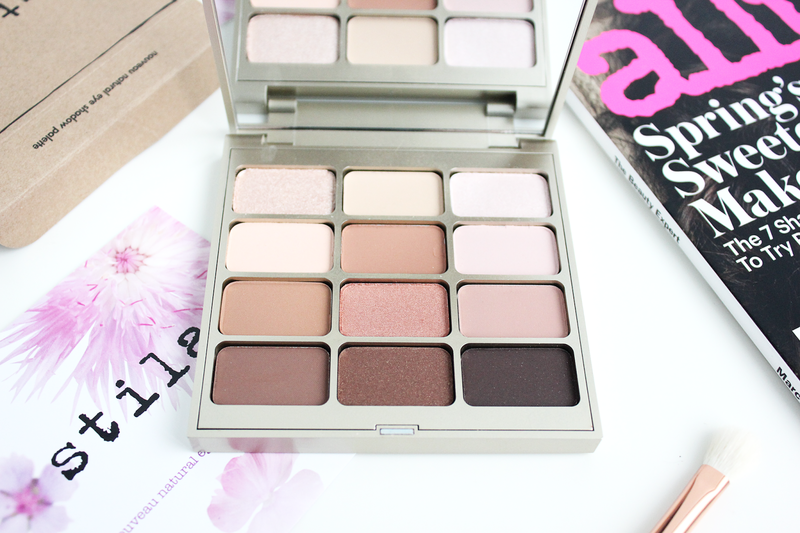 The Naked Basic's is a great palette and this one is very similar - just with extra colors. It would be a great addition if you use your Naked on a lot! What a gorgeous palette, love how wearable the shades are! I haven't tried anything Stila before. You definitely should - I've used a few of their palettes and always love them. I can't say too much for their other products but they have a new lip product out that looks amazing!